SALE! Hurry for a limited time only! "LADY IN RED " Large 20x26 by DeMartini born 1927, the last of the golden age pinup artists and the only artist mentored by the great Alberto Vargas 1896-1982. 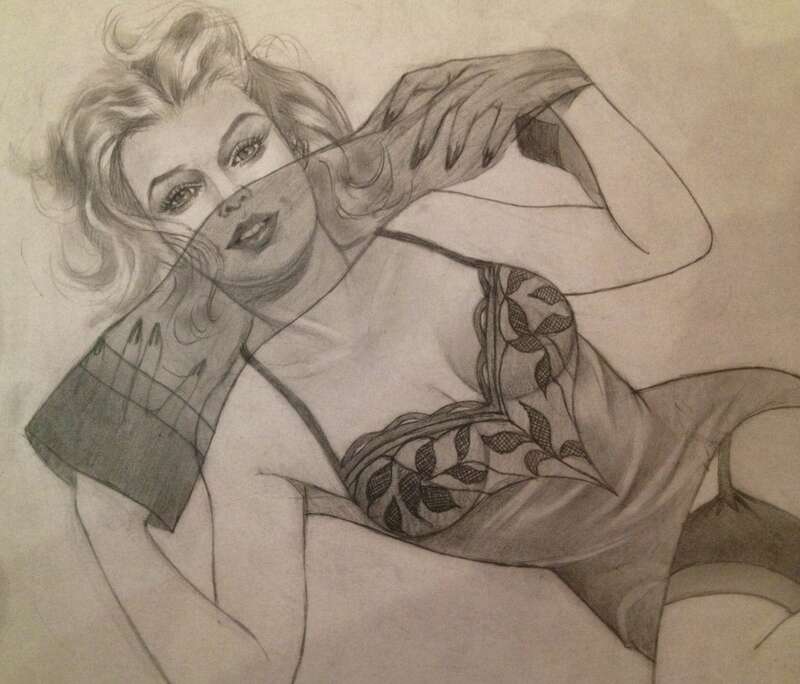 Drawing circa 1970s an original concept drawing of a private burlesque pinup in sheer see through lingerie, garter, stockings, being playful with see through nylons with seams. See Demartini sold and auction higher valuations below. 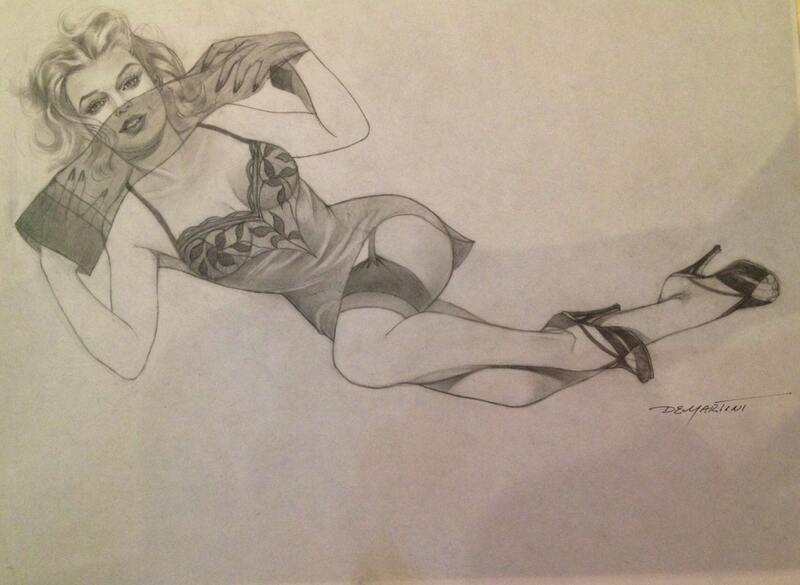 A rare original DeMartini Vintage Pin-Up drawing 2001 used as the final drawing and tracing for 2 paintings of the same name, Sold by us, Final best, for $3500 and the prelim painting for $2000 and this one resold later by the owner. This drawing is actually more lively and more detailed than the paintings. The Matching Original painting sold by us several years ago, however the Print of this painting also available. 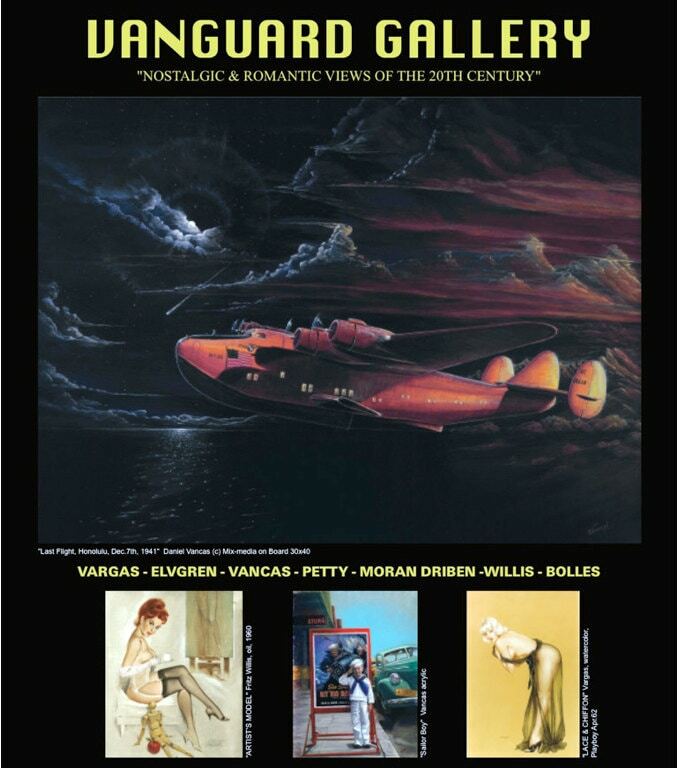 Also see are other rare vintage original paintings and drawings of all prices, by DeMartini, Zoe, Mosert, Elvgren, Vargas, Varga, Fritz Willis, Peter Driben, Earl, Moran, Munson and more. *DEMARTINI HAS ESTABLISHED and PROTENTIALLY CLIMBING VALUES. A Vintage Drawing on transfer paper, used for vintage published Original Painting . 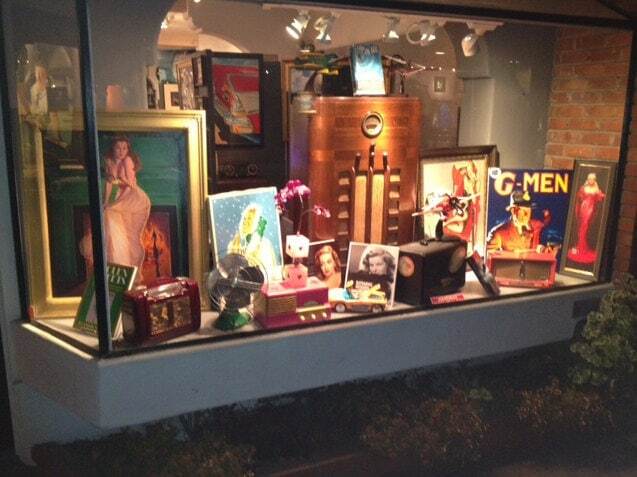 Fine execution, very creative and innovative design all by DeMartini. Good condition considering age, long term storage, this drawing was only intended for transfer to painting board and reference by the artist. With some age discoloration and edge wear. Some foxing edge and storage wear and pin holes. Created circa 60s or 70s, perfect condition, stored since new by the artist sold to Vanguard Gallery in 2001 and in private art archives since.